The green jersey is awarded to the winner of the points competition. It’s been slightly tweaked this year to reward those who win sprint finishes in particular. It was widely believed that this would play into the hands of Marcel Kittel, who appears to have become the top sprinter over the last couple of years. However, the big news is that there’ll be no Marcel Kittel. Kittel fell ill earlier in the year, then he tried to get fit, but being behind where he should have been, he got stressed. When you’re stressed you don’t sleep as well, you don’t recover as well and you can’t train as hard. When you can’t train as hard, you fall further behind and try and play catch up and it’s basically all a big mess. By all accounts, Kittel is sprinting as well as he ever has done. What he can’t do is stay in the peloton until the finish. He can go plenty fast enough for 12 seconds, but it’s the preceding hours that are the problem. That, in a nutshell, explains the art of sprinting. You need to have endurance to get to the finish; you need to be able to maintain a high speed for a prolonged period in the final few kilometres; and then, if you meet those entry requirements, you have to be the fastest of those who are left. Peter Sagan is not the fastest sprinter, but he’s among the fastest and he’s in with a chance of winning far more often than many of his rivals because he can stick with the peloton on tougher days. He’s won the green jersey in each of the last three years but last year was utterly pissed-off that he couldn’t win a stage. Sagan’ll have less support this year because he’s riding for the same team as Alberto Contador and most of the team will be looking after the Spaniard, but he’s probably still the favourite for this competition. 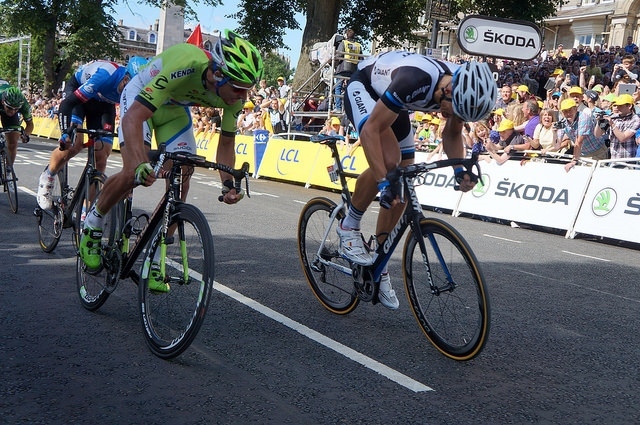 Mark Cavendish won’t be pleased at the absence of Marcel Kittel, because he’ll have wanted to beat him. Even so, he’s probably now the outstanding sprinter at the race. Cav’s been winning plenty this year, but took 21 of his 25 stage victories while riding for HTC-Highroad between 2008 and 2011. By his standards he’s due a few stages. In the absence of Kittel, the Giant-Alpecin team will give full support to John Degenkolb and his moustache. Usually Plan B, Degenkolb is a better all-round rider than his German countryman and should get good results on stages on which Kittel could never compete. Without Kittel, he’ll get a few more points on sprint days and so could compete for green. He won Paris-Roubaix this year, which is no small matter. Michael Matthews has the twattiest nickname in the peloton – ‘Bling’ – but other than that seems an all right sort. He’s not dissimilar to Degenkolb as someone who maybe isn’t the very best sprinter, but who can also compete on hillier days. Same again for Edvald Boasson-Hagen and by this point you’re probably wondering whether there are any out-and-out sprinters taking part beyond Cavendish. I presume Nacer Bouhanni will be involved and Andre Greipel will be there with his big meaty legs and then there’ll be a load of other people who I’ve forgotten because I don’t pay much attention to people who generally finish third on sprint stages but maybe occasionally win. Oh no, wait, I’ve forgotten one very, very important contender – Alexander Kristoff. Like Cavendish, Kristoff tends to do better and better as the Tour wears on. He can really sprint and he’s also having an excellent season, having won the Tour of Flanders. Make no mistake, the jet-powered truck is a very real contender.